Also, you will not get any certificate of destruction. Free is definitely a good price. A regular paper shredding service can be rather pricey, but you get the certificates of destruction and the on-site destruction. About the best you can do for price is $40 to get them to come to your site, and then you pay $10 to $25 per banker’s box. 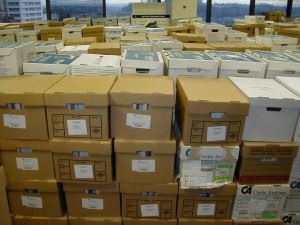 A banker’s box is roughly a cubic foot of space, so a cubic yard of files would cost you, best case, $40 plus 27 x $10 or $310. Let’s say you have an office with a lot of paper to get rid of — 18 cubic yards (the capacity of our Junk King truck). If you call a shredder, you’ll pay, best case, $4,900. Junk King could haul that same paper straight to the Covanta plant where they burn it at 1,800 degrees to make electricity. We would haul that amount for $600. Also, you don’t have spend hours pulling the files out of plastic folders and three-ring binders and such. You can save days of your labor. True, you don’t get a certificate, but you save days of your labor and $4,300! For that kind of savings, you could follow our truck to Covanta to watch the paper burn. Just saying . . . This entry was posted in Debris Removal, Fairfax Junk Removal, Junk Hauling and tagged Covanta, debris, document shredding, hauling on June 26, 2014 by Alex Powers. Last updated August 4, 2017 .